Black won 8 games and White won 6. Moves 271-273. 272 was W pass. 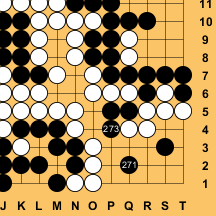 In round 1, LeelaBot played move 273 as shown to the right. Zen19X, with four and a half minutes remaining, did not move and lost on time. In round 2, Zen19X joined its game with JulieBot, but did not move. In the hope of waking it up, I forced it to disconnect from the server. Five minutes later, as expected, it reconnected to the server and rejoined its game; and after a few more minutes it started to move. Aya, running on an i7-980X 3.3GHz 6cores with a GTX1080. Julie, running on1.6 GHz Intel Core i5, 2 cores; no gpu. Leela, running on an Intel Core i5-6600 + AMD Radeon R9 390..
Zen, running on a dual 10-core Xeon E5-2687W v3@3.1 GHz 32 GB RAM with an nVidia GTX-1080.